​A warm welcome to our new subscribers. This issue’s article (at the end of the newsletter) is a copy of the letter of thanks sent by James Glover to Dr Lokesh Chandra who is the President of ICCR (Indian Council for Cultural Relations). This follows the recent highly successful International VM Conference in Kolkata. This is scheduled for the weekend of 18-19th March 2017. Details can be seen here https://instituteavm.wixsite.com/3rdvmonlineconf where you can also register. This Conference was extremely successful in many ways. Please see the letter reproduced at the end of this newsletter, which gives details of the 3-day event. James Glover and Swati Dave are to be highly commended for all the work they put in to ensure everything went so smoothly. It is a great pleasure to announce that the first ever Spanish website on Vedic Mathematics has been created by Nacho Ruiz. His VM eBook is also now available. as I told you in my last email I was preparing a web about VM, today I have opened it, it is the first Spanish website about Vedic Maths (www.matematicasvedicas.org), at the moment there are not many posts little by little I will write and include more, but I was excited to open it because today I have published the first book about Vedic Maths in Spanish too, I am selling it in Amazon. The eBook is about the different Vedic Multiplication Methods and I will donate all the Royalties to a Non Profit Organisation that promotes education in India, Latin America and Africa, it’s called Entreculturas. I have created a video to promote the book these days. The book and the video are in Spanish but I know you have a lot of Spanish speaking students. A recording of this event will be made available. Do not hesitate to contact if you have any questions. To commemorate Swami Vivekananda’s birth anniversary and spread his message ‘BE GOOD DO GOOD’ among the youth about character and nation building, Samartha Bharatha, a non-profit trust had organized a campaign inviting the general public. · Sharing DO GOOD activities on social media and other platforms to inspire others. As a part of this campaign I got the privilege to teach Vedic mathematics for students of a government school. It was an enriching experience. On day one as a warm up exercise, I started with doubling and halving. The response was something which I had not expected. According to those school teachers, the students who had till date not opened up, started enjoying and responding. Every day, I made sure to go with 10 minutes of mental math. In one week, I could teach them multiplication with special numbers, tables, vertically crosswise and Nikhilam multiplication, squaring of numbers ending in 5, numbers near a base, and numbers close to 50 and division by 9. The experience made sure my belief that Vedic mathematics can remove the phobia about mathematics. Let the two numbers be a5 and b5. On behalf of the IAVM and all the delegates at the conference I would like to offer my sincere and heartfelt thanks to you and the staff of ICCR for enabling this conference to materialise. In writing to you I feel it right and proper to provide you with a brief summary report on proceedings and the issues the conference raises. The conference itself was an outstanding success and represents a real milestone in the development of Vedic Mathematics both in India and elsewhere. The support and generosity of the ICCR was extremely well received. The presenters were looked after with great care and beautiful hospitality. More importantly, the conference was a milestone because the Government of India, through the ICCR and Ministry of External affairs, has given the “rubber stamp” to Vedic Mathematics. A total of 22 papers were presented together with 9 workshops and 6 presentations of “global practices”. Had there been a greater number of students and teachers present there would have been more workshops for which we had prepared. Nevertheless, this did not detract from the sheer brilliance and strength of the research papers. The sessions covered a wide scope. Papers were loosely themed according to Vedic Mathematics, Vedic Maths in Education and the History of Mathematics in India. Experienced researchers and educators, both in their papers and presentations, conducted themselves with professionalism and enthusiasm. We saw the results of considerable in-depth work in the field. We also had a series of workshops for students and teachers aimed at enriching and deepening knowledge and practice of Vedic Maths. 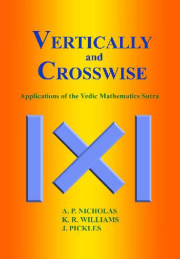 Papers on Vedic Mathematics revealed four key features of the system. Firstly, they demonstrated how the methods can be extended to many areas of mathematics not specifically mentioned by Sri Tirthaji. The second aspect was how fast and efficient the methods are. The depth of understanding of the sutras in any type of mathematics also revealed that they operate universally and are not confined to a particular “system”. Fourthly, the methods were seen as highly effective in developing strategic problem-solving skills. Furthermore, two papers described the wide range of applications of Vedic Maths algorithms in computer architecture rendering high-speed performance. A good third of papers dealt with various aspects of education such as how Vedic Maths can assist with special educational needs, how it can also stretch the most able. We heard how the system affects and promotes endorphins, which give a sense of personal well-being. Two papers demonstrated the results on how effective is Vedic Maths in education. For example, one paper from a researcher in Kerala summarised a four and a half-year project, which tested and compared results with experimental and controlled groups of children. 25,000 were the number in each group. The data has been statistically analysed and the results are truly remarkable. The simple conclusion from this survey should be that the Government of India, through its various education departments, adopts a root a branch overhaul of the curriculum. My own belief is that the integration of Vedic Mathematics into school and college curricula will render India as the world leader in Mathematics education. Several papers dealt with aspects of the incredibly rich heritage of Indian Mathematics, particularly of the classical mathematicians, such as Bhaskara II. There is a wealth of textural material sitting undisturbed in various libraries, particularly in Kerala that could reveal many of the secrets of the brilliant mathematicians from the past. Surely, these texts need care and respect. Several delegates presented their projects and work within their own countries. We called these Global Practices. These are small organisations offering courses through workshops and also conducting research. Looking forward for the year 2017, the IAVM are planning to develop a Vedic Maths curriculum, which can be integrated into schools and colleges. We are already in touch with several universities who wish to have Vedic Maths included in their courses. We also wish to share the results of some of the researches with education departments so that they can see the benefits. In addition, we are writing resource materials, assessments and certificates as well as providing teachers with guidance and consultation. In order to carry forward this work, in its various branches, and to make it more widely available, the IAVM would like to hold the 2nd International Vedic Mathematics Conference commencing on 16th December 2017, preferably in Delhi. To facilitate this, we humbly ask if the ICCR would be willing to again sponsor this important event. Once again, I must offer my sincere thanks to the ICCR and hope that we can work together to help promote and integrate the wonderful system of Vedic Mathematics.